Eternity Rings	There are 78 products. 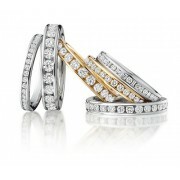 An eternity ring symbolises everlasting eternal love. 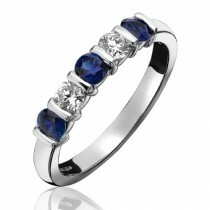 The most commonly used gemstones in eternity rings are rubies, sapphires and emeralds. Every ring featured on our website is in stock and available to view in our showroom where we also have a further selection to choose from. Three perfectly matched round rubies and two diamonds were carefully chosen by our craftsmen to make up this classic ruby eternity ring. Set low on the finger, it makes an ideal accompaniment for any diamond ring or it can be worn on its own. Other sizes of ruby eternity ring are available. Five round brilliant cut diamonds weighing over three quarters of a carat in an elegant claw setting. This fabulous eternity ring goes with any large solitaire or three stone engagement ring but looks equally good worn on its own. Also available to order in platinum. Five round brilliant cut diamond weighing almost a quarter of a carat each in an elegant claw setting. This fabulous eternity ring goes with any large solitaire or three stone engagement ring but looks equally good worn on its own. This one is in platinum but is available to order in 18ct white or yellow gold. 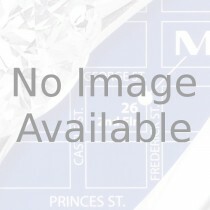 Seven round brilliant cut diamonds weighing a total of 0.62cts in an elegant claw setting. This fabulous eternity ring goes with any large solitaire or three stone engagement ring but looks equally good worn on its own. This one is in platinum but is available to order in 18ct white or yellow gold. This fine platinum band (just 2.5mm wide) has been channel set with ten baguette diamonds weighing over a third of a carat. A simple but elegant band, suitable for wear either as a wedding ring or as an eternity ring. This one is in platinum but is also available in white gold. Three perfectly matched round sapphires and two diamonds were carefully chosen by our craftsmen to make up this classic sapphire eternity ring. Set low on the finger in safe bar settings, it makes an ideal accompaniment for any diamond ring or it can be worn on its own. Three perfectly match round rubies and two diamonds were carefully chosen by our craftsmen to make up this classic claw set ruby eternity ring. Set low on the finger, it makes an ideal accompaniment for any diamond ring or it can be worn on its own. Other sizes of ruby eternity ring are available.